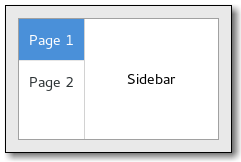 In order to use a GtkStackSidebar, you simply use a GtkStack to organize your UI flow, and add the sidebar to your sidebar area. You can use set_stack to connect the StackSidebar to the Stack. Set the Stack associated with this StackSidebar.